Everyone should meet my friend Malachi (màl-e-kī.) 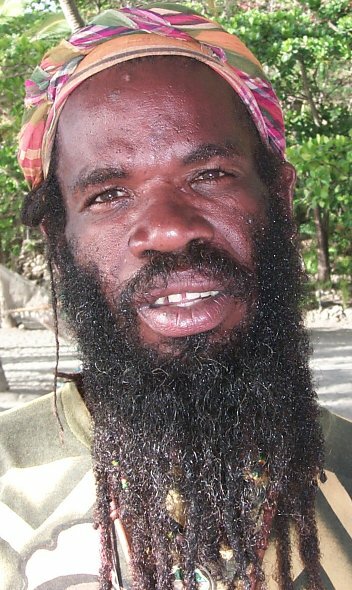 He’s a guide that takes tourists aboard his boat to show them the wonders of St. Lucia and a devout Rastafarian that uses every opportunity to celebrate his faith. His boat is a fiberglass version of a native St. Lucian workboat and is lavishly adorned with Rastafarian symbols. There are paintings of Rasta Heroes including Bob Marley and, of course, Haile Selassie. Malachi did the paintings himself with considerable skill but, I have to admit that the thing that catches my eye is the sticker on the back of the outboard that says, "Jah is my copilot." The boat is named Sun Rise and he keeps it in a slip at the base of "A" dock at Rodney Bay Marina. When he’s at the dock no one can pass Malachi without saying hi and no one can just say hi and be on his way. Malachi always wants to talk. He says, "Brother, look at the day the Lord has given us." He then goes on to relate a dream or premonition that foretold the beautiful weather or some bit of good luck that he’s presently enjoying. If it’s raining then the lord is washing the earth for something special he has planned. There is no such thing as a random occurrence to Malachi. Every event, big and small, is part of the Lord’s greater plan and will be to our benefit if we show enough patience and, above all else, faith. Anyone’s first encounter with a Rastafarian can be uneasy but this doesn’t usually happen with Malachi. Through the dreadlocks, beads, and other accoutrements of his religion shines a bright and friendly face. 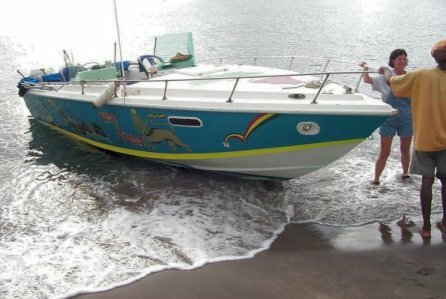 People trust him, which is why tourists eagerly hop into his boat and let him whisk them off to the Pitons or some other place of beauty along St. Lucia’s western shore. Malachi is a successful businessman. But successful businessmen sometimes need money for capitol improvements. There was the day in late September when Malachi corralled me and wanted to discuss something other than his usual dial-a-prayer message. He showed me a photo of his other boat. The photo was laminated, which indicated to me that there was a spark of practicality in him that contrasted his more obvious spiritual side. Unlike his first boat this was a powerful sport boat that featured two big 225 hp Johnson Outboards. It was obvious that Malachi owned this boat. The paintings were even more dramatic than on Sun Rise. In one Haile Selassie was driving a war chariot pulled into battle by three ferocious lions. The boat’s name is Lion of Judah. He explained to me that the engines were not running and he needed some used parts that were available in Martinique. The plan was to use Sun Rise to tow Lion of Judah up the west coast of St. Lucia from its present location in Soufriere to Rodney Bay where his contacts in Martinique would deliver the parts and he would complete the repairs. The hitch was that he was short of money. Right away I knew that I was going to give him the money. There were worries, not about his integrity or his intentions. They were concerned with the idea that his plans may turn to garbage and he may not be able to repay me. It didn’t matter. I could come through the other end as a colossal sucker but I knew that I was going to give him the money. "Give me a few minutes, Malachi." I said. "I’ll get you the money." Conveniently Rodney Bay Marina has two ATMs. Malachi smiled, "I will tell you this my brother. The Lord will shine on you and I will pay you, two weeks." There was another reason for Malachi to tow Lion of Judah to Rodney Bay Marina. There was a hurricane out in the Atlantic that had a better than even chance of, if not making a direct hit, at least passing very close to St. Lucia and Rodney Bay Marina is a much more protected place than Soufriere. It was aboard Brian and Alexis’ boat, The Legend, that we convene the daily "weather club." They are Canadians who four years ago closed their law practice, moved aboard their 45ft Beneteau and began voyaging. Their adventure has taken them from Vancouver to Panama on the west coast and then through the Panama Canal into the Caribbean and finally to St. Lucia where, for a while, they are taking a break and have settled into dockside living. With tireless persistence they coaxed Cable and Wireless (the local telephone monopoly) to run a phone line to their dock. Because of this they are the one boat at Rodney Bay Marina that has Internet access and are able to download weather maps and satellite photos. Every morning a number of us will gather around Brian’s notebook computer aboard The Legend, study the satellite photos, and try to come to some conclusions about the weather that was coming our way. Isaac was out there and was a dangerous category three hurricane but it was curving to the north and, for the time, it wasn’t anything we had to worry about. However to the southeast of Isaac there was a distinct blob of convection that the weather gurus proclaimed ripe for development. We decided that if there was anything to worry about this was it. A day later the blob had a name. It was tropical storm Joyce and the forecasters had it strengthening to a hurricane and passing uncomfortably close to us. Actually the forecasters had a difficult time telling us anything about its projected track. This was because the several computer models used to predict storm tracks gave widely divergent forecasts. What was being said was that Joyce would stay well south of the latitude of St. Lucia tracking due west and at some time begin a turn to the north. This turn to the north was what was being debated among the computer models. No one was willing to say when or where the turn to the north would occur in spite of the fact that the timing of this event determined which island in the Eastern Caribbean would take the hit. There was actually one forecast that called for Joyce to stay south and never turn north but that was from the French Weather Service in Martinique and, being English speakers, we were disinclined to believe anything from the French. Since there was so much uncertainty we unanimously agreed that we should assume the worse and prepare our boats and ourselves for a direct hit from hurricane Joyce. This meant securing the boats in the slips with extra dock lines and, in some cases, anchors. In addition it would be prudent to remove the sails, canvas, and anything else from the deck and rig that can get loose in heavy winds. Bellatrix, being small, can be prepared in a relatively short time so after setting the extra dock lines I reserved doing the rest of the preparation until I was finished helping those who had larger and more complicated yachts. Among the others was Sylvester Dave and Terry’s forty-five foot catamaran. Since Terry was back in the United States visiting relatives leaving Dave alone to do all the preparations a number of us jumped in to help him out. Both Dave and Terry describe themselves as novices since they have only recently purchased Sylvester, which is their first boat. They have what I consider a healthy attitude. They tirelessly glean knowledge from books and other sailors and, because of that, they are noticeably more knowledgeable than others with many more years of experience. It’s an attitude worth emulating even for sailors with more experience. Another yacht left with only one person aboard was AnnaCay, a sixty-six foot charter yacht that would normally be staffed by a professional crew. Graham and Brigitte, the captain and first mate, were back home in South Africa getting married leaving Krik, the owner, alone aboard AnnaCay to fend for himself. She’s a big yacht. The mast extends over one hundred feet above the water and the pressure of hurricane force winds against this colossal spar would generate extreme forces. Special measures would be necessary to ensure her safety. She was oriented with the bow in toward the dock and, since it would be prudent to use her anchor to pull her away from the dock against the force of the stern lines she had to be turned around. In addition the stern lines themselves had to be specially rigged. The existing cleats and bollards on the dock were not strong enough to hold such a large yacht in a storm. The stern lines would have to be attached to chains looped around the dock pilings. Krik is an English gentleman who is a true Bon Vivant. He loves good company and good conversation and is a generous and entertaining host. For the rest of us this can sometimes be a little dangerous. There are mornings when upon awakening we can remember never intending to party so much but there were so many open bottles of wine and when Krik pulls a cork it’s thrown over the side. He also has a proclivity to do things with flair. Because he’s a generous tipper he never seems to be without someone to carry his luggage making some of his arrivals a festive parade of porters followed by his own grand entrance. On these occasions Krik would not be out of place wearing a pith helmet or perhaps a turban. Krik is not averse to doing a bit of hard work however. He jumped right in with Brian and I when Dave needed help getting Sylvester ready, helping us carry kayaks and dinghies from the foredeck trampoline to the cockpit where they would not be blown about by storm force winds. When we were finished with Sylvester it was midday on Friday before the expected Sunday evening arrival of hurricane Joyce and it was time to secure Krik’s AnnaCay in her berth. AnnaCay is a huge yacht so any maneuver with her cannot be entered into without a detailed plan on how it should be executed. We hatched a plan. Brian would take charge of the dock crew, which was made up of Linda and Alexis in addition to himself. Krik would steer AnnaCay while I manned the anchor windless and Dave, stationed on the stern, served as the line handler. Krik wanted as much coaching as we could offer but, in the end, we decided that Brian, standing on the dock, was in the best position help Krik align his yacht for the final approach to the dock. To avoid having two people shouting instructions at him I reserved my comments for times when we were too far from the dock for Brian’s instruction to be effective. Dave put himself on record that he didn’t want to say anything. Also, it has to be said that while Krik was worried about damaging his beautiful yacht, his skill as a boat handler is better than the impression he was giving us. So it was time for the rubber to meet the road (or whatever.) Krik started the engine and manned the helm while Dave and I cast off the dock lines. A jab with the bow thruster put AnnaCay safely away from the pilings and finger-piers. Yes indeed AnnaCay has a bow thruster, a sort of sideways propeller that can be extended down from the bow to push it to port or starboard, whatever the moment demands. So with the clearance offered by the magic of the bow thruster Krik confidently put her in gear and backed away from the dock. In a timely fashion Krik had AnnaCay turned around and, with some hand signals from me, had the bow over the spot where the anchor was to be placed. If this were aboard Bellatrix I would grab the muddy anchor chain about a foot away from the anchor itself and lift up to let the anchor roll off the roller and hang from the bow. Holding tight to avoid letting the chain get away from me I would then begin to pay out the rode until there was a sufficient amount and then cleat it off to let the sternward motion of the boat set the anchor. Retrieving the anchor would be a hand over hand exercise of hard physical labor. It would be a logical assumption that, since AnnaCay is more than twice the size of Bellatrix anchoring would be more complicated. On the foredeck next to the anchor windless are two buttons. One labeled "out" and one labeled "in." Over each was a cover to prevent anything from happening should someone accidentally step on one. Normally one has to reach down to manually flip these covers out of the way but, since I was barefooted, my big toe proved sufficient. Now for the tricky part, to let the anchor out I stepped on the button labeled "out." The windless immediately obeyed and started paying out the anchor chain. The anchor smoothly came off the roller and started its descent to the bottom. As AnnaCay gathered sternway my only labor was to keep my foot on the button labeled "out." Retrieving the anchor would be every bit as taxing with the added responsibility of using the deck wash hose to clean the mud off the chain and anchor as they came aboard. "I could get used to this." I thought to myself. The first attempt at backing to the dock went awry when Krik’s attempt to line her up with the bow thruster produced unexpected results. Krik learned from this and, while his second attempt had to be aborted due to a strong crosswind, the third attempt brought her in on target. Dave tossed the lines and the dock crew quickly secured them. My job was to step on the button labeled "in" to tension the anchor rode against the pull of the stern lines. AnnaCay was now successfully "med-tied" so named because this manner of securing a vessel is popular in the Mediterranean Sea. Krik was visibly relieved. He managed to steer his yacht stern-first into the dock without any damage. In spite of our success, however, there still was much to do before we could call AnnaCay secured for heavy weather. We still had to secure chains around the pilings for the permanent stern lines. Krik suggested that "we pause in our labors for some refreshment" but the rest of us, seeing a slippery slope, voted to continue our work to completion. Then if a party spontaneously broke out at least the work would be done. The procedure for getting the chains around the pilings was to work from a dinghy to get a rope "messenger" around each piling which, in turn, is used to pull the heavy chain around the piling and tie it off to keep it from sinking. At that point the stern line can be attached to the chain. Since the smallest and most appropriate dinghy for the job was the one belonging to Bellatrix the job of passing the chains fell to me. I don’t mind telling you that it was a bit of a struggle. The tide was high leaving only a few inches of piling above the water. After a few false tries I hit on the idea of tying the rope to something that floats so that I could give it a shove and be able retrieve it on the other side without having it sink away from me. A small fender did the trick. After shoving it from one side of the piling it sat waiting for me on the other side. It was a reach, however, and while extending out to grasp it I steadied myself by hanging on something that was conveniently placed under the dock. For the moment I didn’t concern myself with what that something might be. It was just in the right place to help me retrieve the messenger rope. Soon enough I had the rope in my hand and was about to congratulate myself when something let go in my other hand and was hit square in the center of my face with a torrent of water. I had been hanging on the PVC water pipe and doing so had undone the elbow joint leading to the dock spigot. Things were getting complicated. I first had to secure the messenger rope in order not to loose it. This was while being pummeled by the flow of water from the broken pipe. When the rope was secure I turned to the task of fixing the pipe. Well, I didn’t actually fix the pipe. I grabbed a piece of rope and, after pushing the parts back together, lashed it in place with hopes that this would hold until we could get the marina staff to do a proper repair. I was soaking wet but was finally ready to pass the first chain and secure it to one of AnnaCay’s stern lines. Getting the chain around the piling went smoothly but I was then faced with the job of using shackles to attach the ends of the chain to each other. The issue was fatigue. As I worked the weight of the chain was quickly tiring my arms and hands so when I finally succeeded in shackling the ends together I told the crew on the dock that I needed the stern line rather quickly before my strength gave out. It was Krik’s job to pass the line down to me from AnnaCay’s stern but when we called for him he was nowhere to be seen. Where was Krik? Things were getting serious so I quickly passed up the messenger line and had Brian tie it to a cleat. This took a considerable load off my arms so, for the time being, I was able to relax. I did, however, keep my right hand on the shackles. I did not trust the situation enough to let go. So, there I was laying in my dinghy with my right hand extended down in the water holding on to the chain and waiting for Krik to finish whatever he was doing and pass me a line. All activity came to a stop. We first looked at each other and then up to AnnaCay. A few seconds passed and finally Krik emerged from the cabin balancing a tray of tall glasses. "We’ve all been working so hard I’ve thought to make Gin and Tonics for everybody." He announced to us. "Come get your G & T."
We were somewhat astounded and for a minute couldn’t say anything. Finally Linda looked at me and asked, "Krik’s here, what do you want?" "Uh… I’ll have that G & T." I calculated that I had sufficient range of motion in my free hand to take Krik up on his offer. After that things went quite smoothly and we soon had AnnaCay properly secured to the dock in spite of the fact that the party had begun early. Next morning was Saturday, the day before the anticipated arrival of Joyce. We were getting mixed signals from the weather gurus but it looked as if Joyce was most likely to pass south of us. We’d still get quite a bit of wind and rain but not the full force of the storm. Prudence dictated that we continue with our preparations but we started to breath a little easier. Krik wanted to put out a second anchor and arranged with me to help him later that afternoon. When the time came I jumped into AnnaCay’s dinghy and maneuvered it to the bow where Krik was waiting in order to lower the anchor and it’s rode into the dinghy. I was to then back the dinghy out into the harbor while paying out the anchor rode. When the rode was completely out I would then drop the anchor to the bottom and Krik would snug up on it to make sure that it was set. But before we could do any of this we herd someone bellowing from the dock. We stopped our activity and looked over to see what was the cause of all the commotion. It was Brian calling to us and telling us that there was no need for a second anchor. The latest advisory was out and Joyce was weakening fast and would certainly pass well to the south. We would feel little or no effects. The French were right! After all the frenzied activity we suddenly found ourselves with nothing to do. I joked to Krik that I was disappointed that I was not going to get to drive his dinghy. (An Avon rigid-bottomed inflatable with a 50hp Yamaha that drove it like a bat out of hell.) Krik brightened up and said, "I’ll tell you what, you drive my dinghy and we’ll take it outside the lagoon into the bay where you can open her up. On the way back we’ll stop at the Eagle’s Nest for a beer." Of course I was agreeable to this and when we suggested it to Brian he was eager to join us. We all piled in the dinghy and puttered down to Sylvester and invited Dave to join us. He was first reluctant since he had not heard the news but when Brian updated him he said, "Oh, why not." We were soon past the entrance channel and my moment of glory had come. I pushed the power lever all the way forward and we took off like a scalded ape. Amongst the high spirits and merriment Krik’s hat flew off and fell into the water. I carved a wide turn and we retrieved it. Then it was my turn to loose my hat requiring us to repeat the maneuver. Having had my fun I steered back to the entrance channel. It was time to report to the Eagle’s Nest for a beer. Of course when did you ever hear of a bunch of guys go out for a beer and just have a beer? The Eagle’s Nest was along the narrow canal that led into the lagoon where Rodney Bay Marina was located. There you can sit and drink your beer while watching boats traveling inbound and outbound. As I was idling up to the dock we thought we saw something in the water that might foul the propeller. I turned away and then back to the dock making a somewhat awkward landing that was entertaining to all. I didn’t care. Nothing was damaged and I was thirsty. When we found our table Krik asked the waitress if she wouldn’t mind washing his and my hats in some fresh water. With a somewhat sour look she picked up each hat with thumb and forefinger much the same way one would pick up a dead rat by the tail. While she shuffled away Krik reminded her that we each wanted a beer. Time passed as empty bottles accumulated and the conversation got more raucous. We met a young couple from New Jersey and invited them to join us. Before us in the canal an endless procession of watercraft passed by. A waterborne Homecoming Parade, yachts and working craft of all sizes. I peered down the channel toward the entrance and concluded that what was coming next had to be the main event. Two garishly painted boats, one towing the other. But wait… …its Malachi! There he was steering Sun Rise with Lion of Judah in tow with three young St. Lucians aboard laughing and obviously having a good time. We stood and rushed to the edge of the dock waving and cheering. "Hey Malachi," I called. Waving my freshly washed ball cap. He stood with one hand on the tiller of the outboard and the other gesturing to the sky. It was indeed a beautiful day and Jah had seen fit to turn the storm away from us. "A little faith, my Brothers." Who’s to say, the French were right all along but perhaps they knew about Malachi’s unstoppable faith. After Malachi disappeared down the channel we returned to our table and held our bottles high. We did it Lads; we survived Hurricane Joyce.